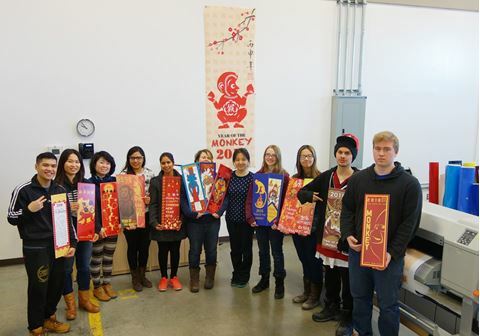 We’re now in the lunar Year of the Monkey (“Fire Monkey”) and to celebrate, Downtown Winnipeg Biz put out a wide call for entries for street banners. Jan Hamilton’s Graphic and Print Technician program answered, submitting 22 amazing designs. The winner was announced at a celebratory dinner at the well-known Kim Koon restaurant in Chinatown on February 20th. The participating students are shown in the MITT print shop next to the college’s new large format printer. The winner is Zhiling Liu (navy polka dot jersey – centre), who started in September and originally hails from Zhejiang Province in northeast China. The winning banner is shown on the wall behind the students who are holding the designs they submitted to the contest. It’s shown at actual size of 9 feet high. The MITT GPTech program is the only program in the region which offers highly integrated training which starts on a Mac and then gets carried through to being printed, packaged and shipped. One of the busiest pieces of equipment that Jan has in the classroom is a large format printer, which is in huge demand these days. Several candidates have already had job offers including from some of the largest employers in the province, and who are eager for qualified graduates such as Jan’s. Printing is a billion dollar industry in Manitoba and we host some of the largest and most successful printers in the country, many of whom export their finished products around the world and to our neighbours to the south.